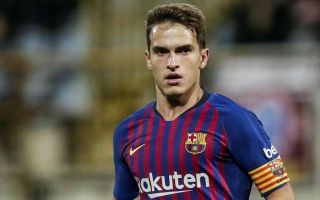 Barcelona midfielder Denis Suarez has no doubt raised one or two eyebrows after sending a message to Arsenal right-back Hector Bellerin on Instagram amid ongoing talk linking him with a transfer to the Emirates Stadium this January. The 25-year-old has been linked with Arsenal by a variety of sources, though a recent report from Sport also suggested Chelsea and West Ham could be in the running for his signature this winter. Still, having played under Gunners boss Unai Emery at Sevilla in the past, it makes sense that links with the north London giants seem to be the strongest at the moment, and he’s only gone and fuelled that fire by interacting with Bellerin on social media. Of course, he hasn’t just gone and publicly told his fellow Spaniard ‘hey we’re going to be team-mates soon’, but nevertheless, in this day and age any interaction among players like this in transfer season is usually worth keeping an eye on. Commenting on one of Bellerin’s outrageous outfits, Suarez said: “Tienes cosas”, roughly translated into English as “what things you have”. The Daily Star posted this screen grab of the comment as they provide an update of sorts on the latest linking Suarez with Arsenal. The Spain international certainly seems a good fit for the club as Aaron Ramsey nears the end of his contract and players like Granit Xhaka remain somewhat inconsistent in the middle of the park.